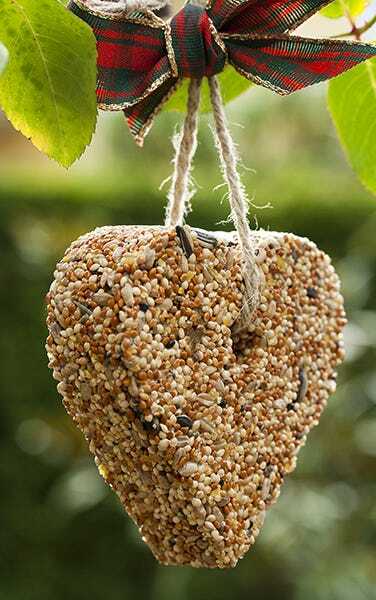 Homemade, heart-shaped bird feeders not only help our feathered friends but also make a pretty ornament for the garden. Sprinkle the gelatine over ½ cup of cold water. Let it sit for a couple of minutes until the gelatine has absorbed the water. Heat 1 ¾ cups of water in a pan, then add in the gelatine mixture. Stir until dissolved and then stir in 3 cups of birdseed. Allow the mixture to cool until the gelatine is thick and coats all the birdseed. Wrap a piece of foil along the bottom and up the sides of a heart-shaped cookie cutter. Spray the foil and cookie cutter with cooking spray. Pack the birdseed mixture inside cookie cutter. Place a piece of straw in the birdseed mixture to leave a hole for hanging the bird feeder. Allow the mixture to harden and then remove from the cookie cutter. You can place it in the freezer for about an hour to speed things up. Add a piece of ribbon or twine for hanging.